This past week, it was all but confirmed that Jason Momoa will take a break between Justice League and the Aquaman standalone movie to star in the long-delayed remake of The Crow. Today, we have an idea of what the former Game of Thrones actor will look like as Eric Draven. The image comes courtesy of Fan Art from ComicBook.com and render maestro Boss Logic. After playing Conan the Barbarian in a remake of that fantasy adventure and making his first appearance as Aquaman in Batman V Superman, Jason Momoa will next take on his underwater superhero in Justice League. It was believed that he would then immediately resume the role a third time for a solo spin-off, but that doesn't appear to be the case any more. He'll instead take the lead in the long-gestating, often-delayed remake of The Crow, which should hit theaters in 2018, before Aquaman's standalone adventure comes to theaters. This new version of The Crow is said to be a much more accurate adaptation of the beloved graphic novel by James O'Barr. The comic was originally brought to the big screen in 1994 by director Alex Proyas, with Brandon Lee in the lead. As many fans know, an on-set accident took the life of Lee, son of martial arts legend Bruce Lee. Over the years, there have been a number of low-budget sequels, but none of them have ever really connected with fans. Producer of the original 1994 cult classic Ed Pressman returns to shepherd this new version to the screen. And it is expected to be much darker than the DC Films adventures currently in production. Pretty much confirming that he'd locked in the role of Eric Draven, Momoa posted a photo of himself on Instagram. The actor is seen having a few pints with The Crow director Corin Hardy as he exclaims he may have just come aboard what he calls a 'dream job'. At this time, The Crow is the only movie Hardy is known to be casting. Here's what Momoa had to say on Instagram. "The only way to officially seal the deal as men Is a pint of black [email protected] r#sealthedeal#wearemarriednowfucker#greatnewstocome #dreamjob #cantwaittotelltheworld ALOHA ED"
Sources close to the long-delayed project have confirmed that Jason Momoa is officially in talks to join The Crow as its lead character. At this time, a schedule is trying to be worked out so that Momoa can work around his intensive Aquaman schedule, which includes appearing in some of the other standalone movies, though none of those DC cameos have been confirmed at this time. The Crow will follow musician Eric Draven, who returns from the dead to exact revenge on his killers and find justice for his murdered fiancé with the help of a mystical bird. The Crow is said to be 'one of the crown jewels in Relativity's coffers' as the studio tries to recover from Bankruptcy and restore its reputation in Hollywood. At this time, it isn't known when The Crow remake will actually begin shooting. The remake has had its fair share of stops and starts over the past decade, with too many directors and stars attached to even count at this point. Ben-Hur star Jack Huston was last attached to headline the project, but he had to bail as other projects mounted on his schedule, making it impossible for him to stay attached. Jason Momoa will next be seen in The Bad Batch opposite Keanu Reeves. He also stars in the indie thriller Going Under and the action movie Braven. 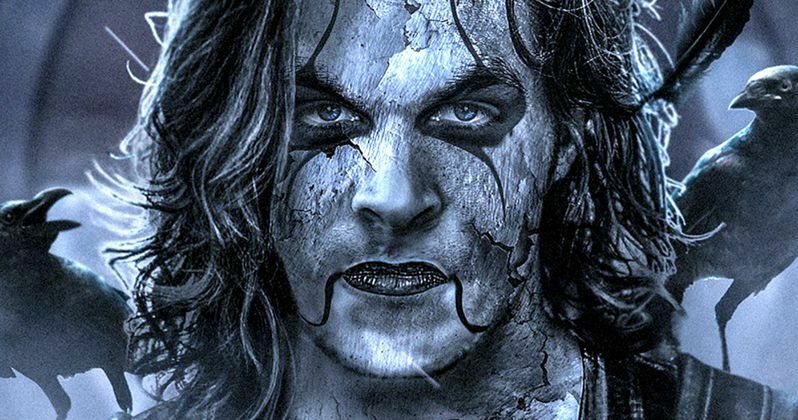 Take a look at this fan art, which depicts Jason Momoa as Eric Draven.